Carrots have become such a staple of the American diet, that it’s easy to overlook their amazing potential benefits. From anti-aging to cancer prevention, we’ll be exploring 5 reasons why we are head over heels for this orange hued power-food. Forget pills and supplements. Who knew how many awesome health payoffs eating carrots contained? Keeping Eyes Healthy You may remember your parents feeding you the age-old adage at the dinner table that carrots will improve your eyesight. Unfortunately, this is a common myth used by parents all around to world to convince children to eat their vegetables. The good news, though, is you can still thank your parents. While carrots do not magically give you 20/20 vision or help you see in the dark anymore than eating blueberries will turn you blue, they are great for overall eye health. Carrots contain an important nutrient for eye health, beta-carotene, which the body then converts into Vitamin A. Vitamin A is essential in protecting your vision and a deficiency can lead to vision problems and eventually blindness. In fact, the leading cause of blindness in developing countries is due to a lack of Vitamin A. Another destructive eye condition caused by Vitamin A deficiency is xerophlthalmia, a painful condition in which the eyes suffer dryness in the eyes, swollen eyelids, halted tear production and corneal ulcers. A balanced diet with plenty of Vitamin A is beneficial in preventing eye diseases and keep the retina and other parts of the eye functioning smoothly. Preventing Heart Disease Since childhood, we have been taught that carrots are good for our eyesight. But did you know that the health benefits of carrots go far beyond our eyes? An apple a day may keep the doctor away but eating carrots actually keep the cardiologist away. Heart disease is the number one killer in the United States and high cholesterol is a major cause. A ten year study from the Netherlands has illustrated how carrots actually demonstrated a reduced risk of heart disease. Carrots not only contain beta-carotene but also alpha-carotene and lycopene, which help in keeping the arteries clean and lowering cholesterol levels. Regular consumption of carrots and vegetables lower the chance of heart attacks and increases the chances for leading a longer, happier and healthier life. Preventing Cancer We’re sure you know by now that beta-carotene is your friend. It turns out it may even be your best friend because it has been found to prevent cancer, most notably, lung cancer. Researchers have found that consuming 1.7 to 2.7 milligrams of beta-carotene reduced the risk of lung cancer by 40 percent. By eating raw carrots, people are able to reduce the risk of colon cancer by nearly 24 percent. Because carrots contain many disease-fighting nutrients, vitamins and antioxidants, they may greatly slow the growth of cancerous cells and guard cells against toxin damage. Anti-aging Wrinkles? Crow’s feet? Blemishes? These words seem to elicit a universal gasp of horror from most women. When it comes to the fountain of youth, the powerful antioxidant, beta-carotene, has been found to slow down signs of aging. While many choose to turn to expensive creams and treatments for aging or healthy skin, it turns out a natural remedy is already available. How so? Simply put, free radicals, which are naturally occurring byproducts of normal metabolism and sun exposure, break down and destroy skin cells, thus causing premature aging. Antioxidants fight free radicals and contributes to the skin cell renewal process. Cleansing the Body Carrots are also rich in glutathione, which is a protein that detoxifies the liver and digestive tract by causing it to release bile and excess cholesterol. The body already naturally detoxifies itself but carrots help in drawing the toxins out of the colon. Have you ever witnessed the glow of someone who just finished a fruit and vegetable cleanse? Today, you can find many different varieties from your commonly loved orange organic carrot to a rainbow medley of carrots (for those feeling colorful). You can even find maroon carrots, which taste a little sweeter and are crunchier than its orange counterpart. Eating them raw will yield different benefits than eating them cooked. Mix it up a little or even turn carrots into juice to get your daily vegetable servings when you’re on-the-go. 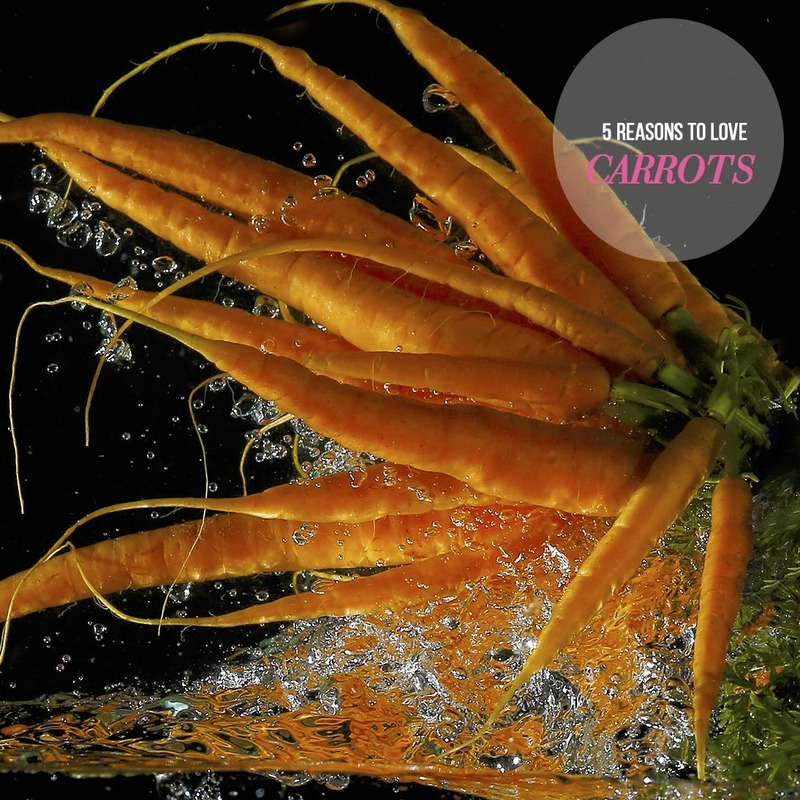 What are YOUR reasons to love carrots? What is your favorite way to enjoy them? I love carrots, especially with some hummus. I didn’t know the “cleansing the body” health benefit. Good, informative post! This makes me want to eat more carrots! We’re so glad to hear that, Brian! Thanks for stopping by!